And the bride wore black | Where to next? We went to the best wedding last night. Our dear friends, Louise (Louie) and Doug, finally got hitched. I’ve been waiting impatiently for this day, even though I had begged them not to tie the knot before we got home from our London to Sydney travels. I remember when they first started dating. From the get-go, Poor John and I thought ‘this is a perfect match’ and at the wedding, we found out that everybody else thought so too. Louie is one of the Bloddy Girls, so she always has lots of people offering opinions. The day was perfect. For the first time in many weeks, it didn’t rain on the Saturday. Last Saturday we got about 5 inches of rain and the temperature barely reached 18°C. But yesterday, the sun came out and the mercury rose to a comfortable 26°C (79°F). Louie and Doug’s stylish ceremony began about 6:30. 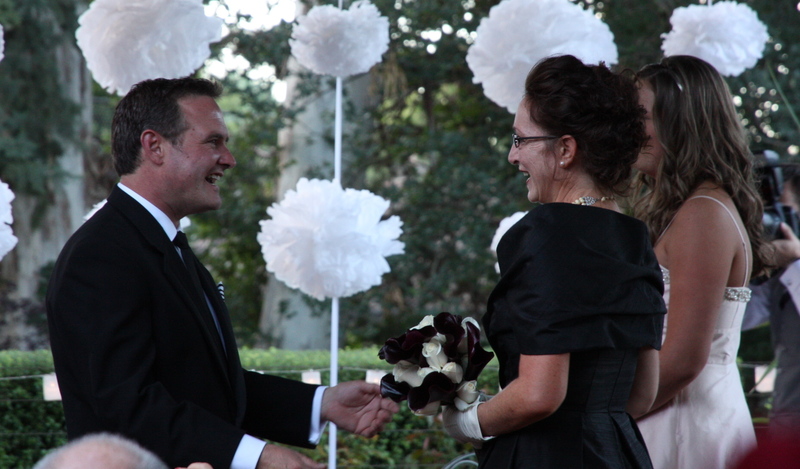 Julie Rattenbury, the marriage celebrant, was gracious and easy-going, the original vows were heartfelt, the smiles were huge and the bride wore black. BLACK, you ask? You bet, and it was perfect—a sensational Dior copy. Louie’s never been conventional, and I’m glad she didn’t start yesterday. And the shoes? The shoes were original Christian Louboutin’s, black patent stilettos with black bows and the signature red soles. It was a cocktail wedding, with a bountiful supply of delicious food and drinks. Catering was by Kindle Cafe and Catering, and I just happen to know the menu. And two cakes—a red velvet (dressed in black and white) for the bride and a lemon curd (dressed as Star Trek) for the groom. Congratulations to both of you and thank you for sharing your sensational day with us. What great nuptials! The bride is stunningly beautiful. It was a fabulous event. I’ll pass on your good wishes. Congratulations to Louie and Doug!! Louise looks wonderful. It looks lit it was a lovely wedding. Was it in Canberra Peggy or at the coast? And nice for me too to see the collective known as the Bloddy Girls after all this time. Thanks Louise. The wedding was in Canberra—in a lovely backyard in Forrest. And the Bloddy Girls send a collective hello. Thanks Derrick. It was a fantastic evening. Thanks Zarinah. The pics make me grin too. Tonight I see that the bride has used the one of them kissing by the cakes as her new Facebook profile pic. Now that really makes me smile. 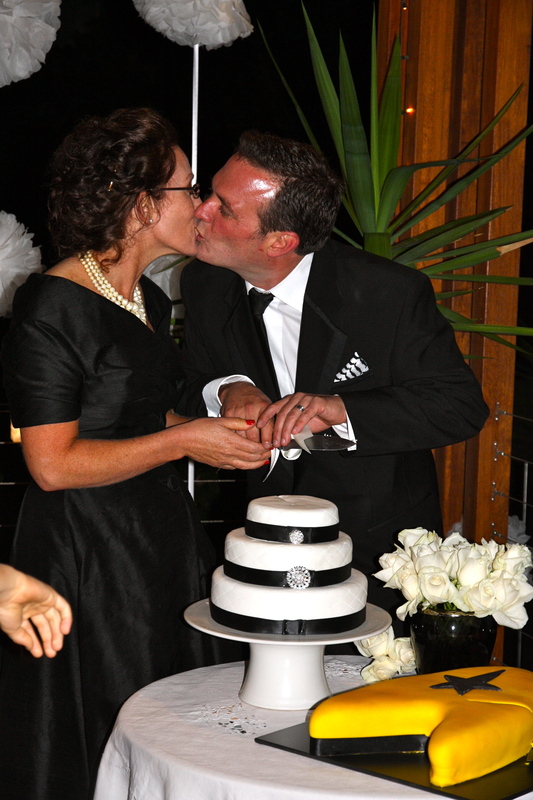 Congratulations Louise (Louie) and Doug on your wedding…. wonderful to see something a little unique, like a black wedding dress. Makes your wedding really special. I’ll pass on your best wishes, Sy. They are a wonderful couple. Both are very dear to Poor John and me. I wish I could claim to have introduced them. Enlighten—seeing Canberra in a whole new light « Where to next?